Free Shipping Included! 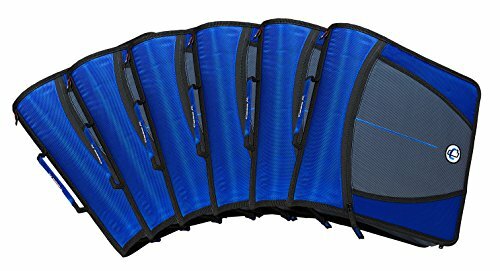 Save 1% on the Case-it Mighty Zip Tab 3-Inch Zipper Binder, Blue, Case of 6 (D-146-C-BLU) by Case-It at Easy Blogging Tip. MPN: D-146-C-BLU. Hurry! Limited time offer. Offer valid only while supplies last. The Case-it D-146 Mighty Zip Tab 3-Inch Zipper Binder is an efficiently-designed 3-ring organizer with a five-color, tabbed expanding file folder. The Case-it D-146 Mighty Zip Tab 3-Inch Zipper Binder is an efficiently-designed 3-ring organizer with a five-color, tabbed expanding file folder. This large-capacity binder also features a gusseted zipper for easy access plus a carry handle and shoulder strap for versatile mobility. The zipper has a unique angled design to make it easier and quicker to zip things up when packed with your important papers and materials. The D-146, like all of Case-it's binders, uses Kraft board instead of PE board to give its binders a firm, stiff shape that won't buckle or warp. The spine is specially designed so that your binder can lay flat when open, making it easier to add or take papers out, and to take notes in. Case-it produces quality binders offering unique organizational tools for school or home use. Case of 6.